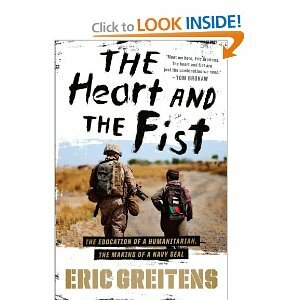 Eric Greiten’s book The Heart and the Fist is his account of his personal journey from university student and volunteer aid worker to Navy Seal and the founder of The Mission Continues, a non-profit that works with wounded American veterans. There are not many books about which I would say I “can’t put down, “ but this one definitely fell into that category. Greiten seems to have fit many lives into one, and at times almost seems to be living two different lives simultaneously. After early experiences in China teaching English and learning Kung Fu, he begins his university studies at Duke. In between his classes he receives a very different kind of education in the boxing gym, while at the same time spending his summers in conflict zones and development destinations around the world. He files dispatches from Bosnia, Rwanda, Bolivia, and so on. After a while his story takes on a kind of Forest Gump quality: he’s in Galway when the Dayton Accords are signed, in Rwanda documenting the genocide, in India meeting Mother Teresa. Really? As Greiten relates each of these experiences, he introduces the reader to a different facet of the challenges of humanitarian aid work: the great difficulty of really knowing the people and places foreigners seek to help, the tragedy of preventable deaths, the troubling reality of travelling across the world to help strangers and yet failing to fulfill responsibilities to loved one at home. But this book is far more than a travelogue. While at Oxford, Greiten writes a thesis on effective aid and his adventures serve as a device to weave together the book’s philosophical questions: What does it mean to live a meaningful life? How is it possible to really help those in need? And the central question- what does it mean to serve others with both goodness and strength? This final question is the one Greiten struggles with as he pursues humanitarian work and reflects on the failure of humanitarian agencies, the UN in particular, to intervene in time to “prevent the strong from massacring the weak.” It is this tension that leads him to enlist in the Navy with the goal of becoming a Navy Seal. The story of this process makes up the second half of the book. His account of the brutal training Seals undergo is very moving and interesting, especially if the reader is not familiar with it. When Greiten deploys as a Seal, the focus shifts from “goodness” to “strength.” But, as might be expected, Greiten puts his humanitarian skills to good use as a Seal. In the end, the book comes full circle as Greiten returns home to found a nonprofit, The Mission Continues, dedicated to helping wounded war vets find new ways to serve and give their lives meaning. Greiten survives his humanitarian and military experiences with his idealism very much in tact, concluding that, “hard decisions are best made by good people, and that the best people can only be shaped by hard experience.” He comes across as a genuinely humble person despite his many accomplishments. I enjoyed this book quite a lot, and found Greiten’s combination of life experience and philosophical reflection to be both thought provoking and personally challenging. For anyone who wants a fast-moving read that also engages the questions of what it means to live life both meaningfully and well, this book should be on your list.